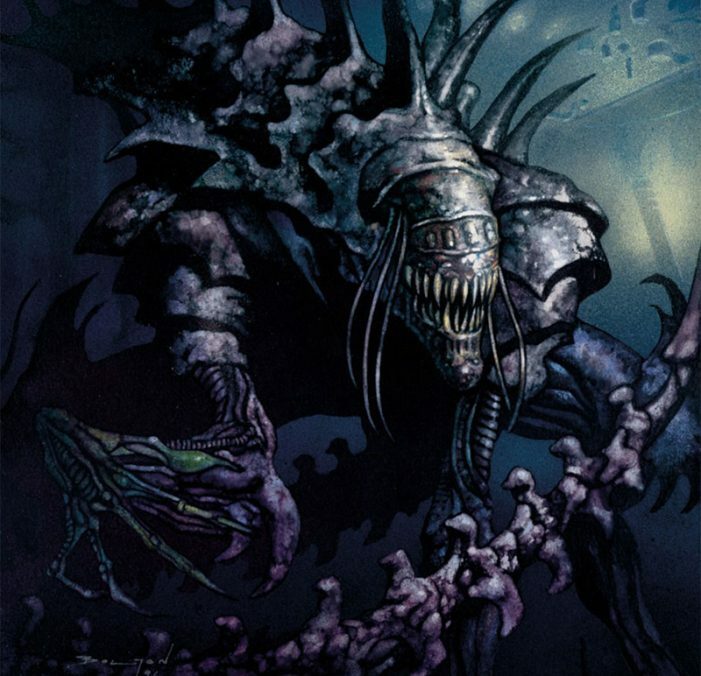 The Alien King is a unique creature that has only appeared in one piece of Alien lore (two if you count the novelization) and that was Dark Horse Comic’s Aliens: Rogue. Rogue was released in 1993 and written by Ian Edginton and revolved around Professor Ernest Kleist’s attempts at bioengineering Aliens for specific purposes on his research facility Charon. The primary focus of these experiments early on involved attempts to bioengineer out the Alien’s innate hostility. Despite early setbacks, Kleist succeeded in breeding tame Aliens by taking advantage of the Alien’s DNA reflex and selective breeding. Kleist specifically chose more docile hosts such as sheep, llamas and other cattle in order to make the resulting Aliens less aggressive. His experiments were so successful that Kleist was able to walk amongst and touch the resulting Aliens. 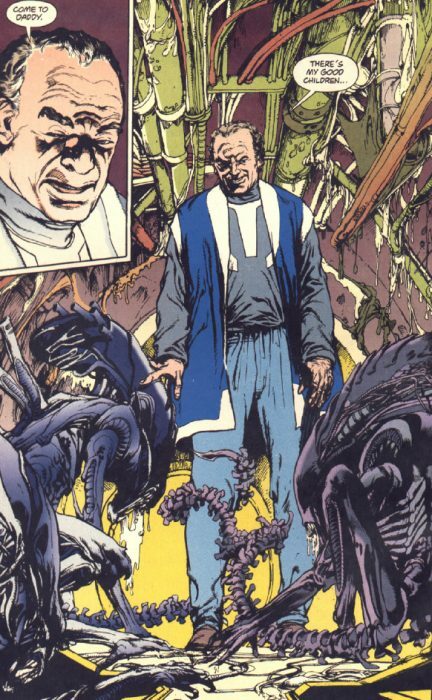 In the comic, during the sequence where we see Kleist touching the Aliens they were depicted as looking like normal adult Aliens with the exceptions that each had a slightly different cowl. One had tubes coming out the back, the other had a slightly ridged head – similar to how the Aliens looked in AvP Requiem. It is possible this was just artistic license, though, and not meant to signify any difference. In the same section in the novelization, the Aliens are only described as being smaller than usual. Despite his success in breeding less predatory Aliens, Kleist’s attempt at breeding the docile equivalent of a Queen consistently failed. Kleist tried utilising royal jelly to facilitate the maturing of a docile Alien into a Queen but this didn’t work. Whilst not explicitly stated in the comic, it seems that Kleist also had access to Royal Facehuggers and also attempted using “dummies” – cloned genetic material designed to mimic living bodies – to gestate the Queen embryos. The resulting Queens all died before reaching maturity. Kleist kept at least 9 of these failed attempts in tanks in his facility. Kleist eventually succeeded in creating his Alien King – his Chimera, his Hybrid, his Usurper – by utilising the DNA of a Grant Corporation spy to grow a “dummy”and a cocktail of Xenomorph DNA, concentrated male hormone and a complex biochemical soup. Kleist theorised that the lack of matriarchal desires – the lack of the drive to breed – resulted in the successful gestation of the Alien King. The Alien King is depicted as being comparable in size to the Queen. Like the Queen it is also has a crest on its skull but is a different shape and is spiked. In fact, quite the King has quite a lot of spikes across its entire body. The body is given a more armoured and bulky appearance. Another unique aspect of the King’s appearance is that it has several small tentacle-like appendages around its mouth. The purpose of these appendages is unknown. The Professor truly believed he’d succeeded in bioengineering a tame equivalent of the Queen as the hybrid showed no aggression towards the Grant Corporation spy when he was put into the King’s pen, tided down and helpless. This proved to not be the case as when the King was introduced to other Aliens, the hybrid reacted in a massively aggressive fashion, literally tearing them apart. The King turned out to be immensely competitive, viewing the other Aliens to be its rivals and a threat to its own existence. It was at this point that Kleist reconsidered the purpose of the King – instead of being able to control his bioengineered Aliens warriors, the King could instead be used to eliminate Aliens – to be humanities weapon against the Xenomorphs. Professor Kleist allowed the King to escape and make its way through Charon Base to the hive where the Queen herself resided. After killing any humans and Aliens that got in its way – including the Queen’s own Praetorian guard – the King eventually reached the Queen and the two began to fight. Despite it initially looking like the King had the upper hand, the Queen eventually subdued the King and killed him. According to the novelization, the Queen was able to utilise her smaller size, faster speed and superior intellect to the wear down the King and finally got in for the finishing blow. So far, the comic and novelization of Alien: Rogue has been the only appearance of an Alien King in Alien lore. In the early 90s an Alien King figure was produced by Kenner but it’s appearance is different to Rogue’s. The concept of the King recently re-entered the fandom consciousness when Sideshow Collectables released their own take on the concept at the end of 2016. Prodos Games, who publish the Aliens vs. 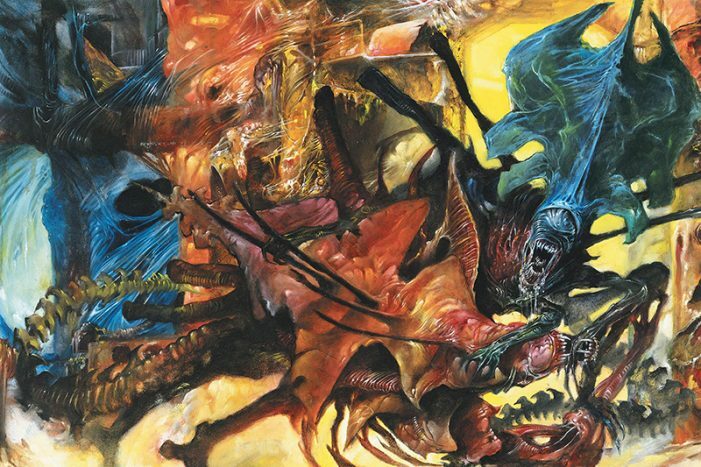 Predator – The Hunt Begins miniature game, have also recently announced they will be releasing their own Alien King unit – known as the Monstrosity – which appears to be closely based on Sideshow’s interpretation of the King.